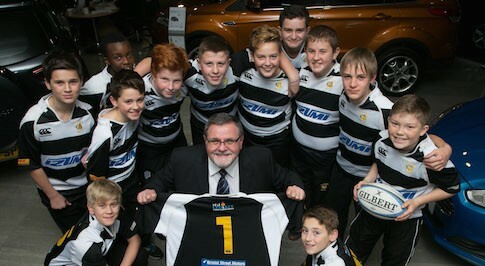 Promising young rugby stars have been given a boost, thanks to Bristol Street Motors Ford in Durham. The dealership has agreed a one year deal with Houghton Rugby Club Under 13s, enabling the club to purchase new equipment for training sessions and help with team building exercises. Lisa Eadington, who works in the administration department at the Ford Durham dealership is a keen supporter of the team and her son, Adam Eadington, 12, has been with them for more than four years. The sponsorship will now provide stability for the team and allow them to progress. Richard Lydiatt, Coach at Houghton Rugby Club, said: "I am extremely grateful to Bristol Street Motors Ford Durham for the sponsorship and support. The boys work hard in training each week and support like this is essential for their development and success." Martin Boagey, General Manager at Bristol Street Motors Ford Durham, said: "We are delighted to contribute to the success of Houghton Rugby Club. It is a family club with a very rich history and we are proud to be associated with them. "Sport is very important to the local community and Bristol Street Motors Ford Durham recognises its role in giving something back to the area."